Pictured above is the entirety of the Universitario de Sucre squad that took on Bolívar on Saturday in Bolivia's top division. Yes, that is only seven players. There were no others on the bench. And those seven are all youth players. Universitario decided to throw this weekend's match after a bit of a beef with the league. Tomorrow night, the team will take on Mineros in the Copa Libertadores, the South American equivalent to the Champions League. Universitario find themselves second in the group with only two matches left, and a win on Tuesday would set them up nicely to progress into the knockout rounds. With this in mind, the team petitioned the league to postpone this weekend's match so that they could focus on the continental competition. The league refused, so instead, the club rested their first team and made their unhappiness apparent by suiting up the seven kids above. Seven minutes into the game, Bolívar had already scored two easy goals and could've had more. Two minutes after that, one of Universitario's children-athletes was down on the pitch with some kind of injury. After it became evident that the young boy could not continue, and with no subs available on the bench, the ref called the match in the 13th minute. 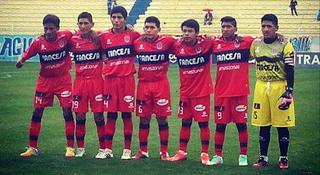 Universitario were credited with a forfeit and a 3-0 loss will be credited on their record. For their part, Bolívar refunded the fans in attendance for their tickets, and put on an exhibition of sorts against their own reserve team. A sorry display all around.